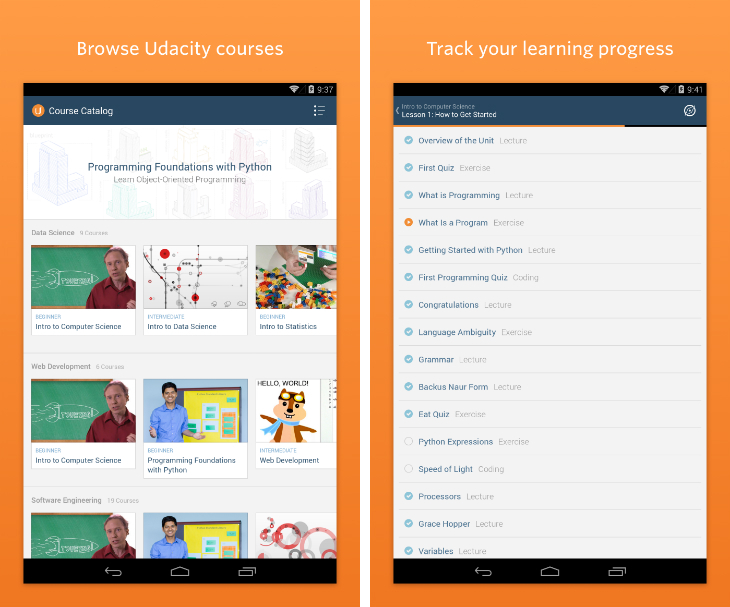 Udacity is expanding its online learning platform with a new Android app and four courses designed in collaboration with Google. After bringing some of its video lessons to the iPad and iPhone, Udacity is turning its attention to Google’s hugely successful mobile OS. The new Android app gives students the ability to stream lectures on the move and test their knowledge with quizzes. The company has also promised an offline mode at a later date, so users can download videos and watch them at any time. To coincide with the launch of Google’s I/O conference, Udacity is introducing four new courses created in partnership with the renowned technology company. The first is ‘Developing Android Apps: Android Fundamentals,’ instructed by Reto Meier, leader of Google’s Scalable Developer Advocacy team, as well as Google developer advocates Katherine Kuan and Dan Galpin. The second is ‘Developing Scalable Apps: Using Google App Engine,’ led by Google developer advocate Magnus Hyttsten and taught by Jocelyn Becker, a cloud solutions education specialist at Google, among others. Rounding out the new additions is ‘Web Performance Optimization: The Critical Rendering Path‘ with Ilya Grigorik, a web performance engineer at Google, and ‘UX Design for Mobile Developers: Learn to Design a 5-Star App‘ taught by Google developer advocate and designer Nazmul Idris. Most of the courses start at $150 per month, with a free 14-day trial for those who need convincing.